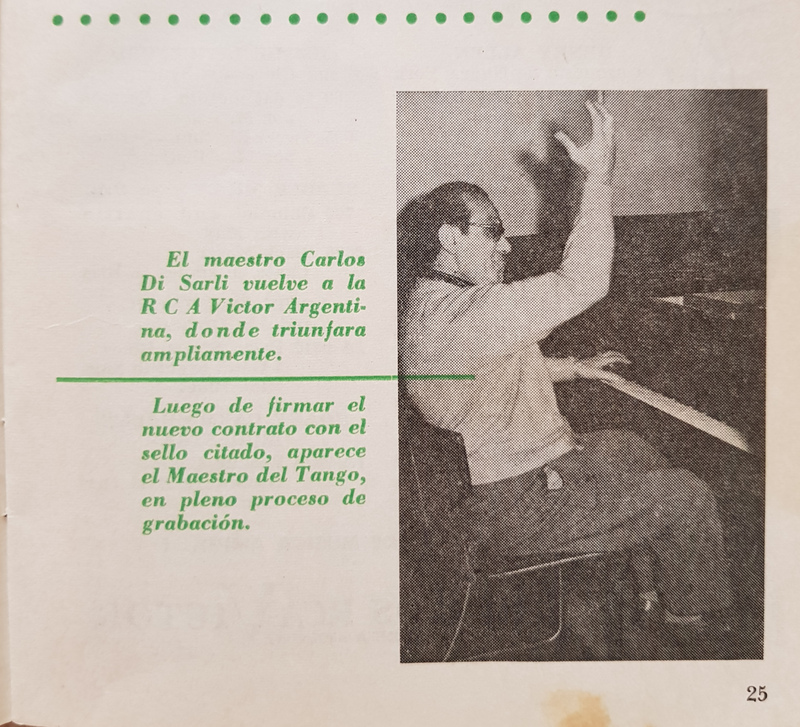 While I was browsing through a pile of Argentine Discomania revues from the early 1950s, I found this interesting interview with Carlos Di Sarli which I would like to share here. 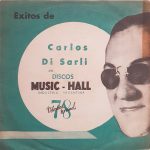 It was made during the rehearsals of the orchestra to prepare the first recordings at the brand new record label Music-Hall and it gives a very interesting insight on the scope and concept of this astonishingly progressive and well done recording project. 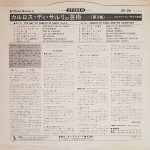 It seems that in the beginning only around 5 records were planned with a total of 20 songs. 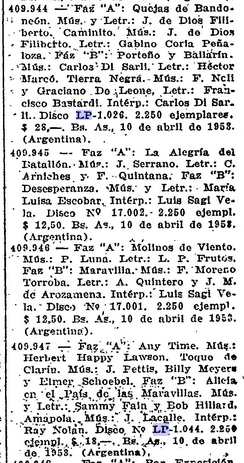 And that the initial idea was to conquer new markets outside of Argentina, like Brazil, the USA and others. 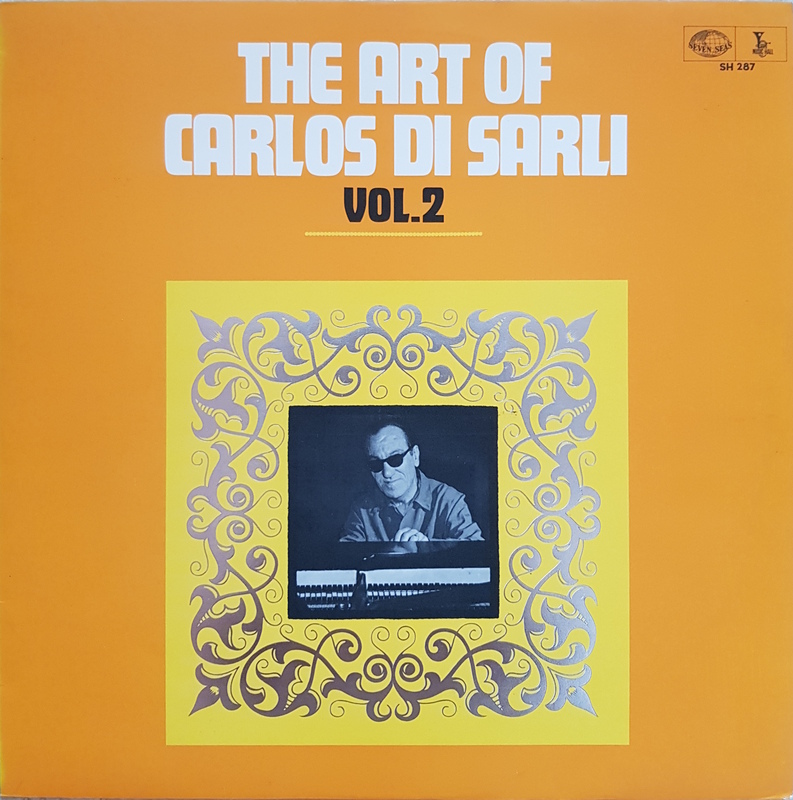 In that regard the use of vinyl makes perfectly sense as the format was about to spread from North to South America and it has by nature a better transportability either as flexible and unbreakable records or as tape copies. 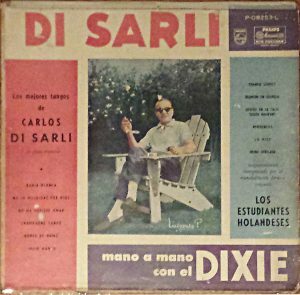 It also looks like as if the Di Sarli MH-project was not only meant to be distributed “for export” but also as an intercultural exchange where other local artists would share some tracks on the same albums with Carlos Di Sarli. 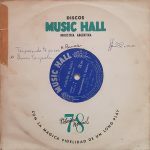 The initial records, though produced in vinyl, were quite short 7″ records with only 2 tracks per side. Later they would grow to 10″ with 4 tracks per side and by the end of the 1950s, they were edited on a series of 12″ LPs with 6 tracks per side. 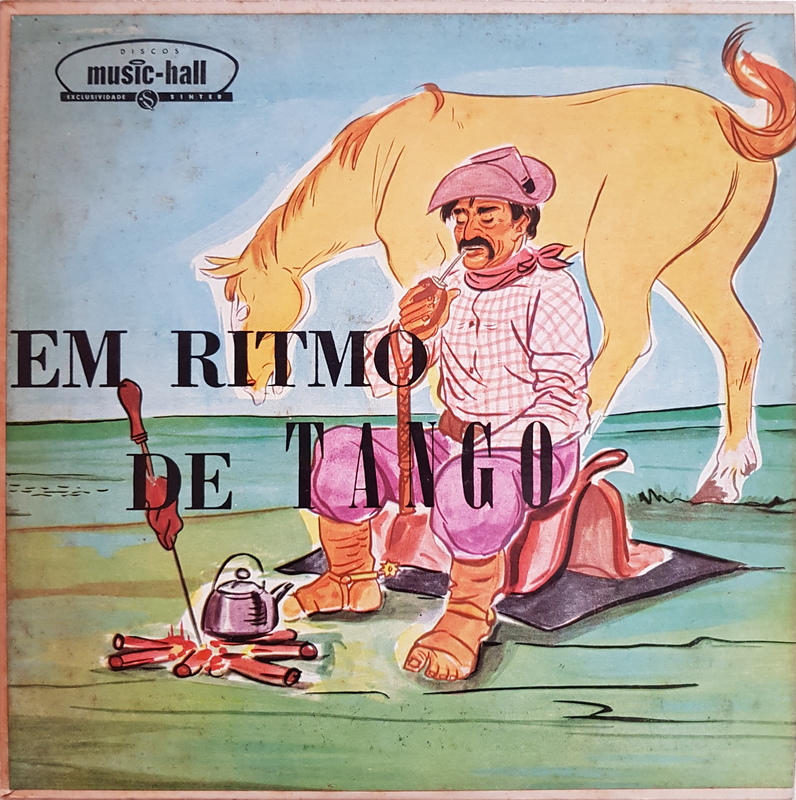 That’s the contemporary LP-format. It took me some time to understand that these small vinyl dobles were the original releases. 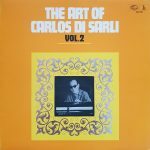 In the beginning I was thinking they were later reissues and that vinyl record production started some years later in Argentina (see my previous articles). 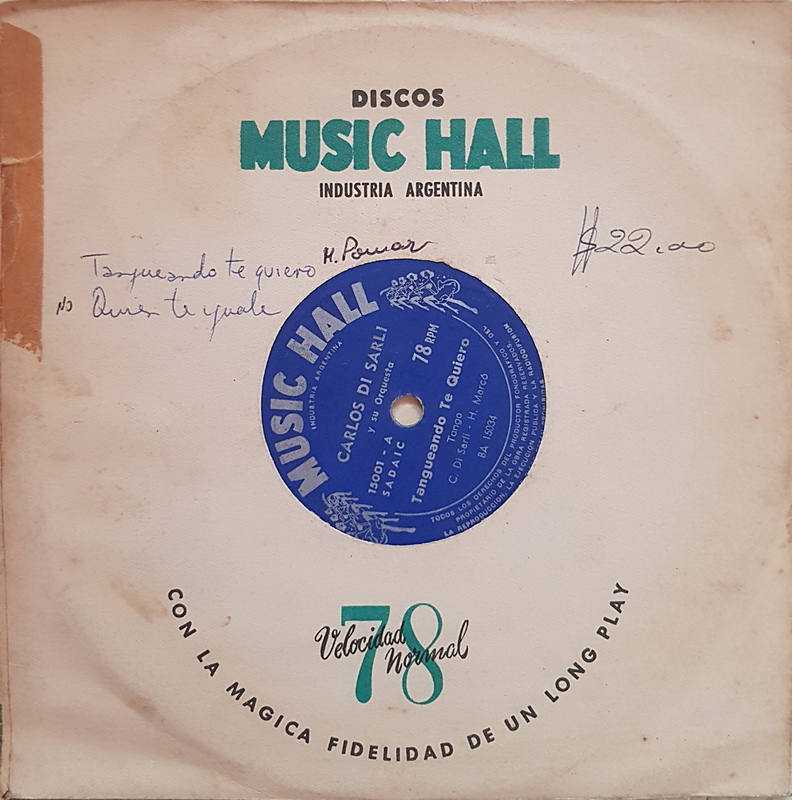 This was really a big surprise to find out, that these were actually the very first tango vinyls ever produced in Argentina! 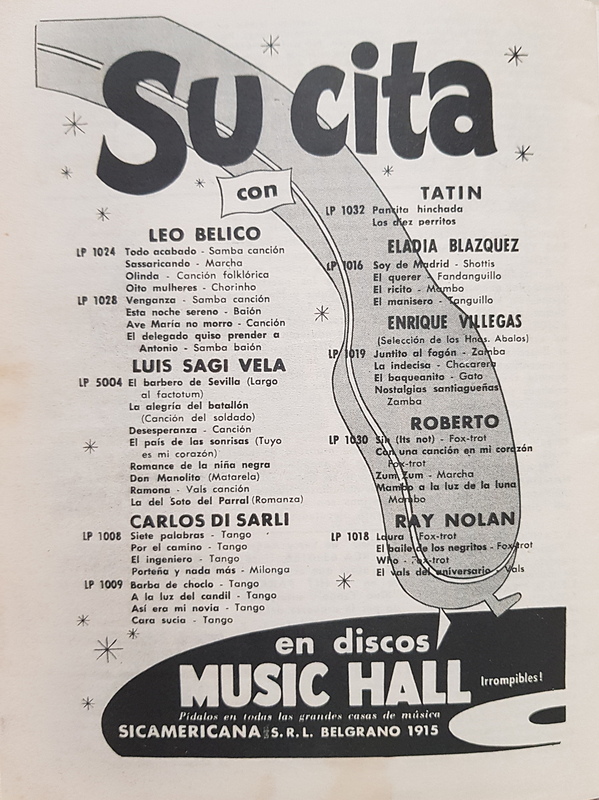 See here for the interview which back in 1951 must very much have been a scoop in the Argentine music industry. Being a reporter for a record magazine has its laps. 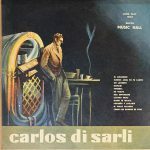 The reading public is very demanding and wants to be informed of all the novelties of the recording industry. And this is a very interesting novelty. 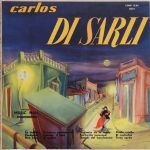 It’s about our first Argentine artist to be recorded on vinyl: Carlos Di Sarli. 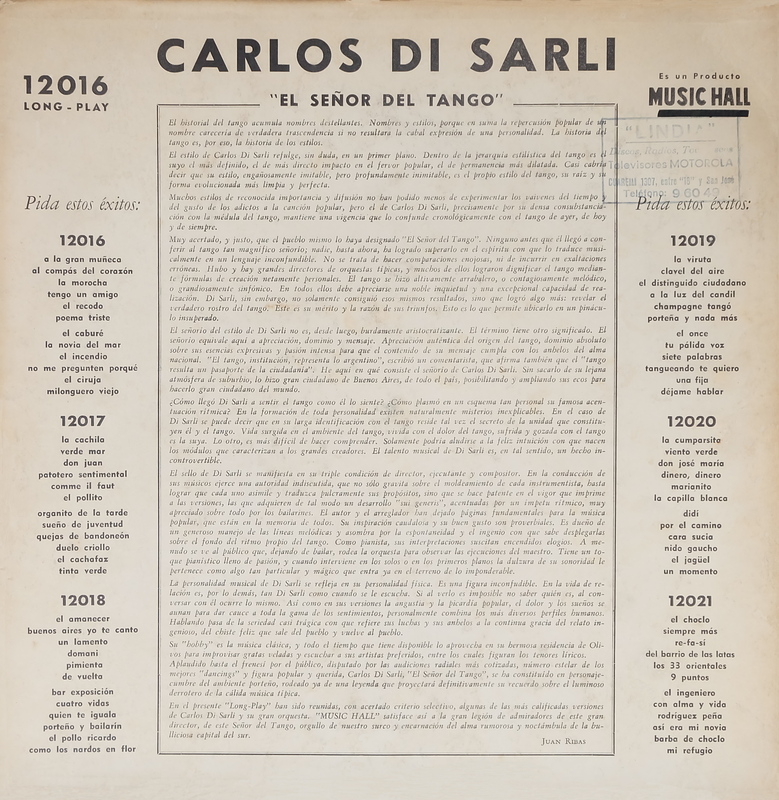 We are heading to the studios of Argentina Sono Film, and we meet with Carlos Di Sarli, who is rehearsing at the front of his orchestra before definitively impressing the fonomagnetic tape that will later be poured into L.P. He stops with his activities, and taking advantage of the rest, we hasten to interview him. “How was the idea of ​​recording on ‘long-playing’ born?” We asked. 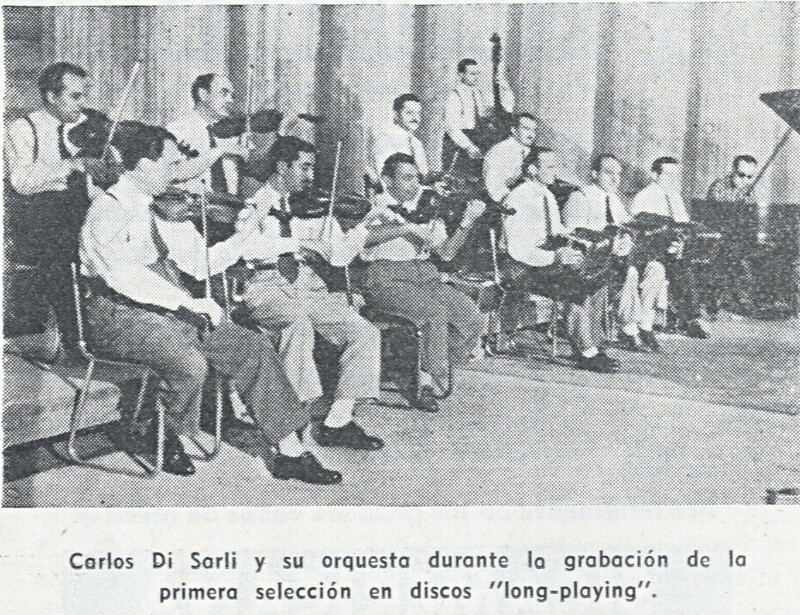 “Yes, but there are no ‘long-playing’ record factories in our country yet.” We said. 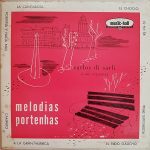 We say goodbye with a handshake, and we leave with the pleasant feeling of knowing that we have now our own ‘long-playing’ recordings. 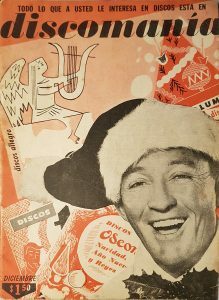 Variety International, Jan. 1952 Issue. 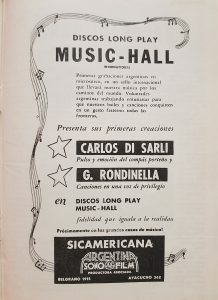 The founder of the Music-Hall label, Armando Gandolfo was an ex-RCA sales manager! 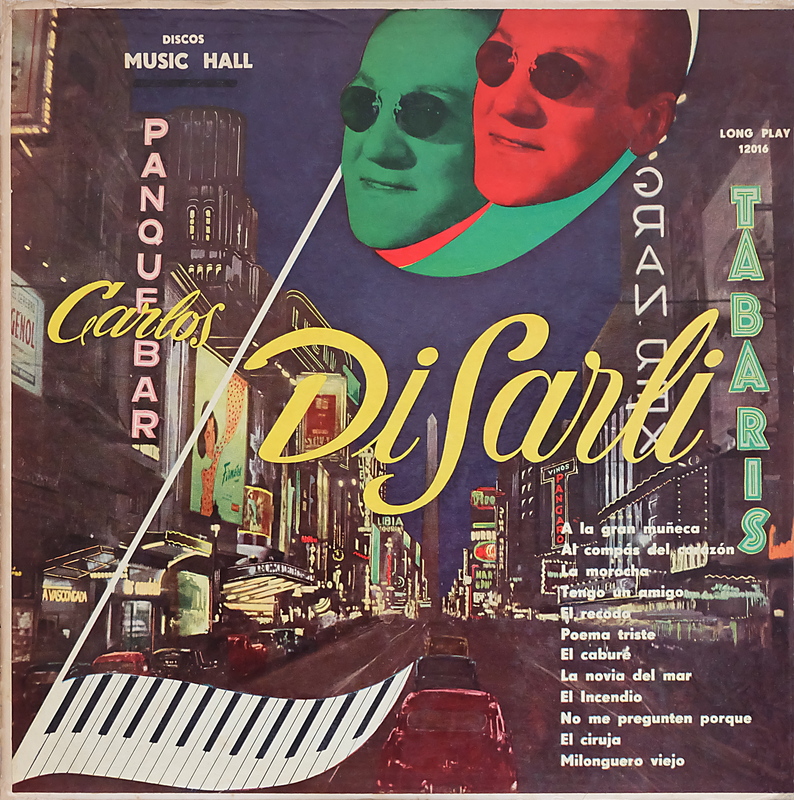 In the end, this ambitious project was downscaled and records were mainly sold in Argentina and Uruguay (there licenced to the local label Sondor). 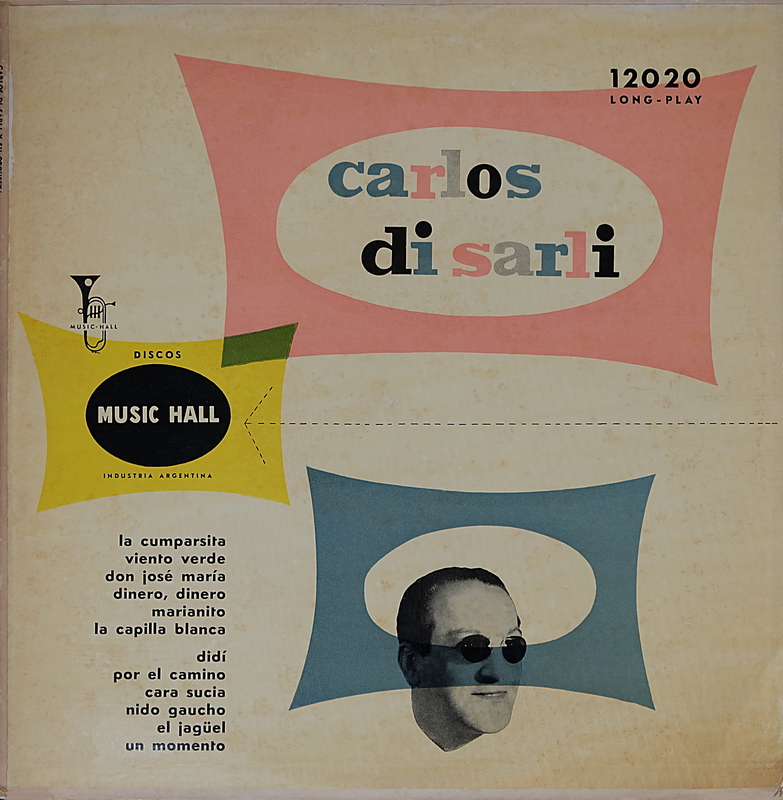 The recordings were made on tape in the studios of Argentina Sono Film in Buenos Aires in a magnificent recording room as Discomania states, and were then sent to the vinyl plant in Peru where the records were produced and sent back to Argentina for domestic distribution. It could be that the stampers were produced elsewhere, like i.e. the USA. 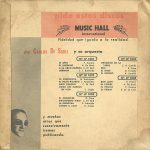 While I was looking at the original releases, I recognised that on the later records an alternative recording location is indicated on the record label: “Grabado en los estudios de Radio Splendid“, it can be verified on LP-1026, LP-1042 and LP-1050. 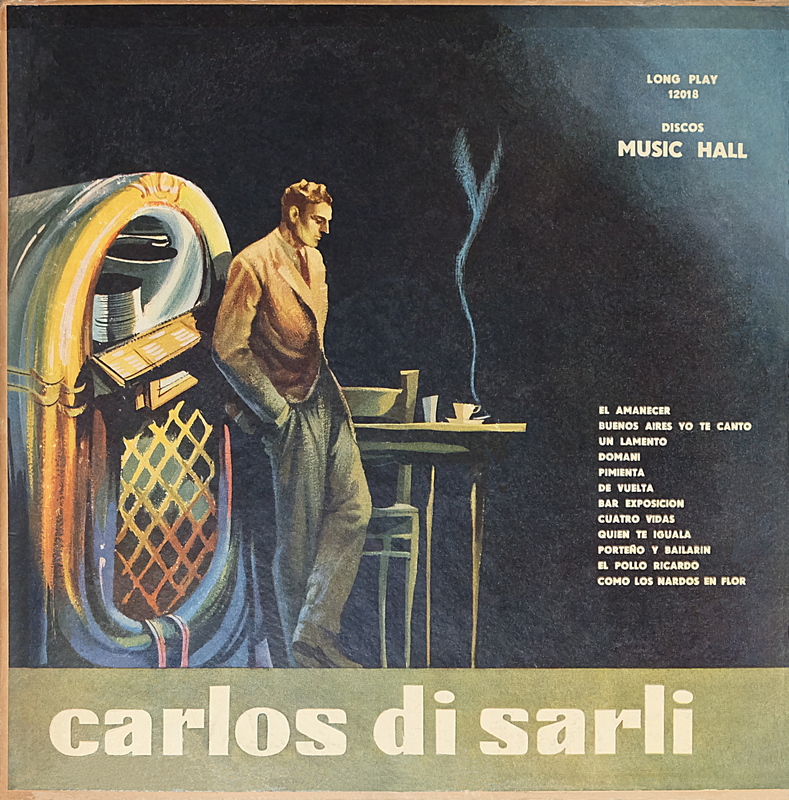 This strongly suggests that they stopped using the Sono Film recording studio for the last records and that the final 24 MH Di Sarli titels were recorded at Splendid’s studios as a replacement. 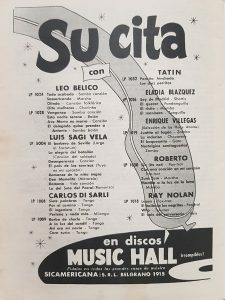 In March 1953, Juan Bautista Monglia sells his shares of Sicamericana, the commercial entity behind Music-Hall, to Héctor Noberto Selasco. This makes Selasco the strongest shareholder and manager of the company. 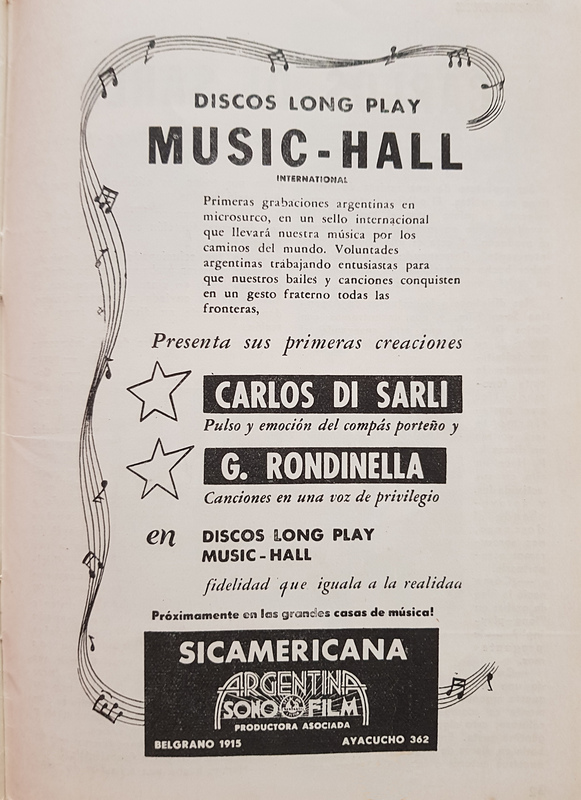 When the articles of association were first published in March 1952, Juan Bautista Monglia, Héctor Noberto Selasco and Armando Gandolfo, ex-RCA Victor sales manager, all had an equal share in the company. 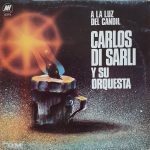 There is actually a coincidence between the capital restructuring of the company, and the changing of the recording studio. 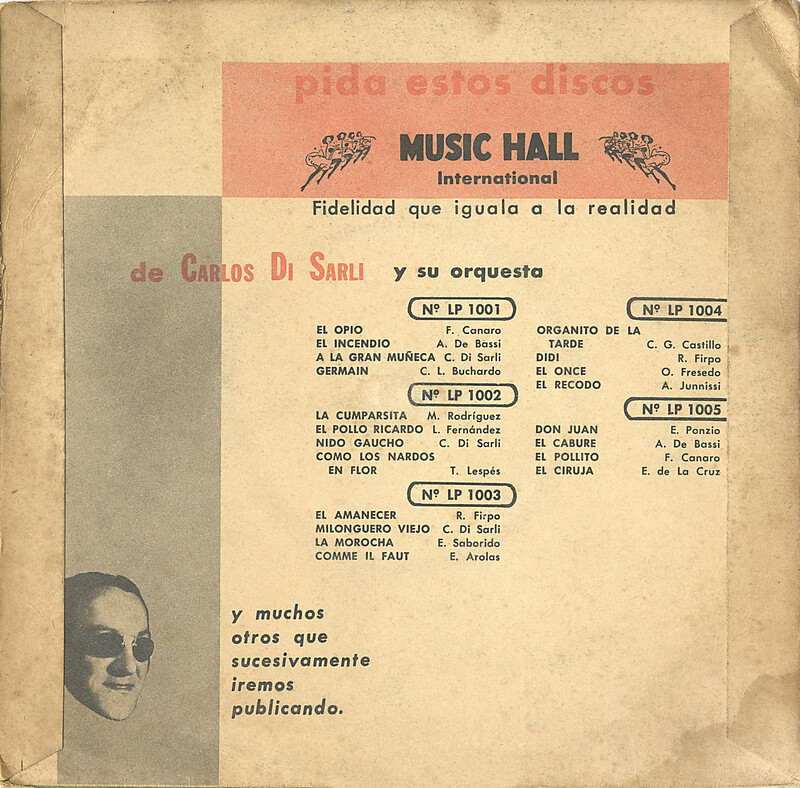 On the first record covers Argentina Sono Film was indicated as “productora asociada” of Sicamericana S.R.L. and it seems that they stopped the coproduction when Sicamericana shrinked to a hierarchical one boss structure. 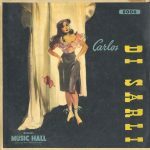 By the way, Wikipedia mentions that only two years later in 1955, Lucas and Atilio Mentasti owners of Argentina Sono Film were being arrested during the Liberating Revolution (Revolución Libertadora) which ended the second presidential term of Peron therefore there could be also political circumstances involved which left the Sono Film studios impracticable. 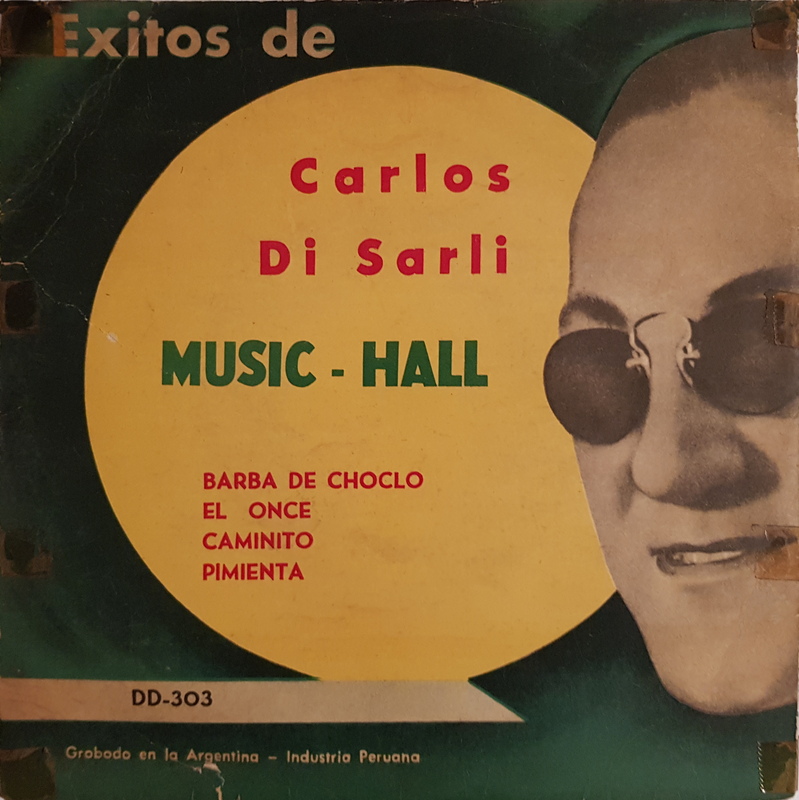 It’s important to mention that the Music-Hall project was very progressive and probably achieved the first Argentine commercial recording with a reel-to-reel tape recorder and a resulting vinyl record production. It’s still in mono but the tape master brings a new flexibility and mobility into the recording process. The studio and the record plant can now be easily at different remote locations. 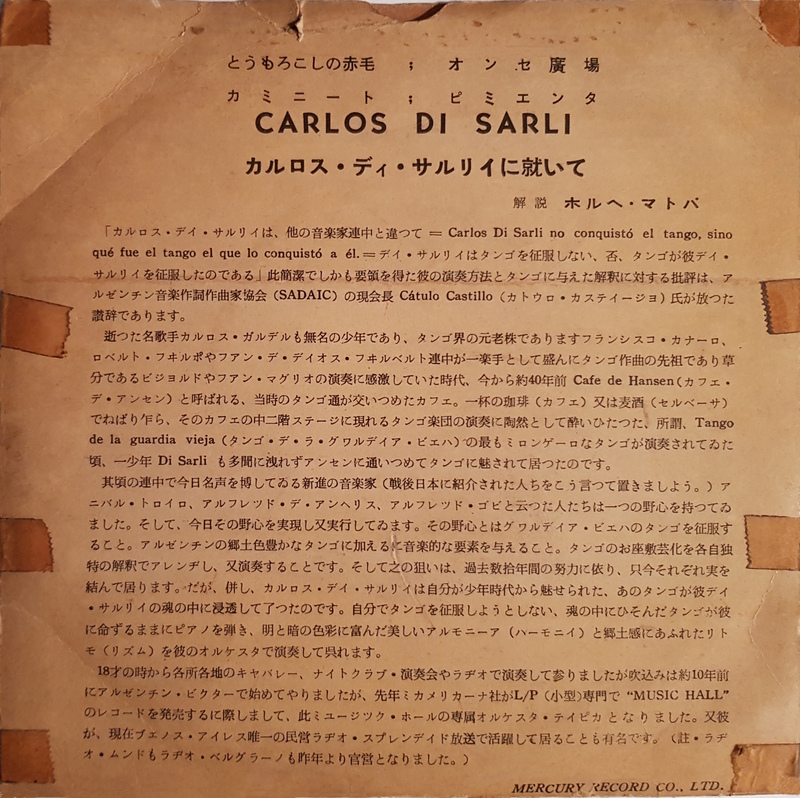 At a later period, after the maestro’s departure, some of the Di Sarli MH records were also commercialised in Brazil and Japan but without the announced guest artists. 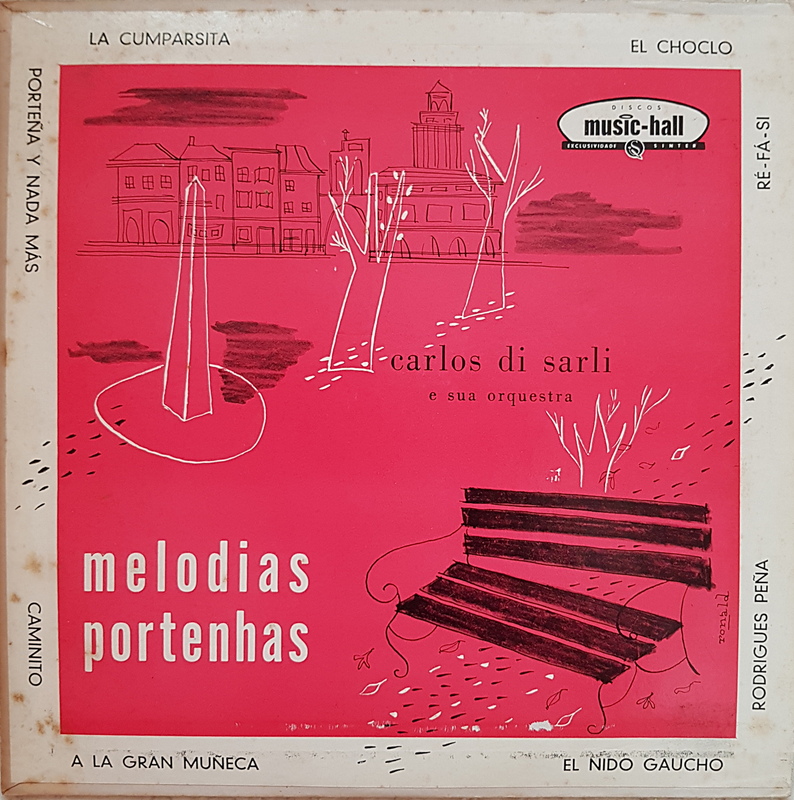 Music-Hall licenced the repertoire to the Sinter label in Brazil and to Seven Seas in Japan. 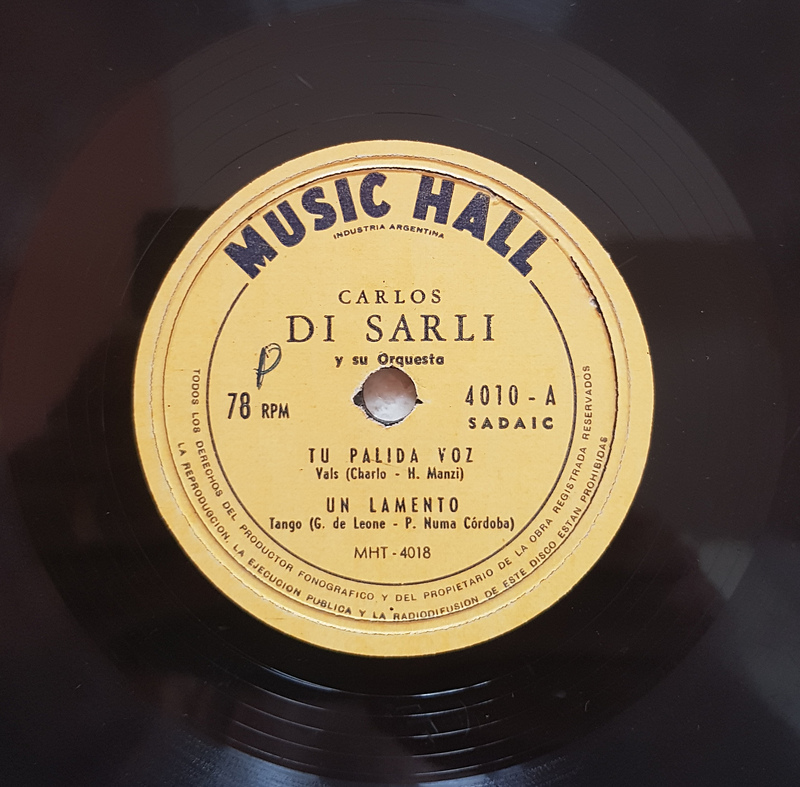 While rethinking the business model from export to a mainly domestic distribution, the whole 33-rpm vinyl format turned out to be a burden for the Music-Hall label as most of the record players in Argentina still had one speed in the beginning of the 1950s: 78-rpm. 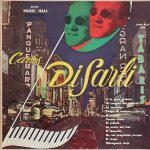 Only the new record players had 3 speeds and who would buy a new record player just to listen to Di Sarli? 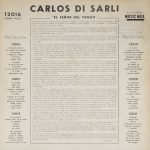 In order to get a better market penetration, in a later phase of the project, a lot of hybrid records were therefore produced from the same titles to achieve backwards compatibility. That’s around the same time when Odeon and RCA themselves launched their own dual distributions: on 78-rpm shellacs and at the same time on the new vinyl format. 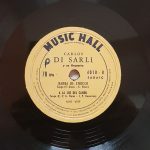 The first 78-rpm Di Sarli Music-Hall edition was published on the 26.11.1952 and is a very curious hybrid because it was in the format of a 7″ record running at 78-rpm speed and pressed in vinyl! The 4000 series was actually produced as 78-rpm shellac records with 2 tracks per side, another curiosity! At least LP-1070 was (re)-issued as record 4011, which is a 78-rpm shellac doble. The 4000 series had a yellow label. 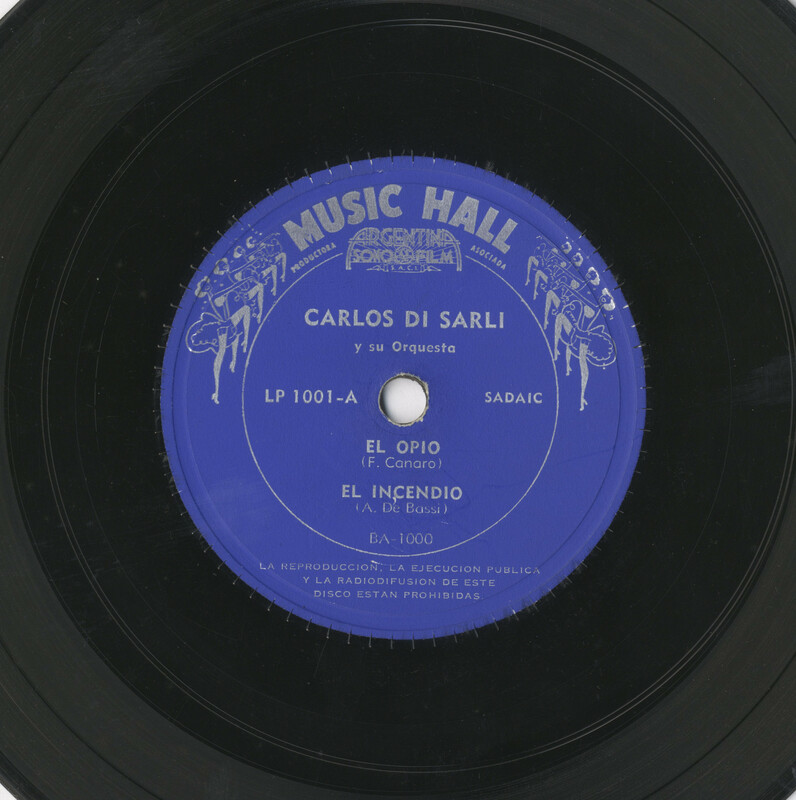 The first MH Di Sarli vinyl records were initially published at very high numbers, at an average of around 14000 ex. And were then gradually reduced to 5000 ex. 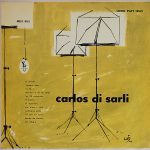 since the vinyl record number LP-1010, the 10th record, and ending with a very small-circulation of 2000-750 ex. or even less for the last vinyl records! 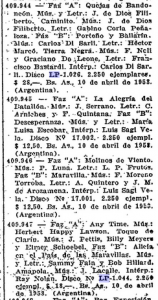 The numbers of produced copies were published in the Boletín Oficial which contains the mandatory legal deposit of every domestic publication. 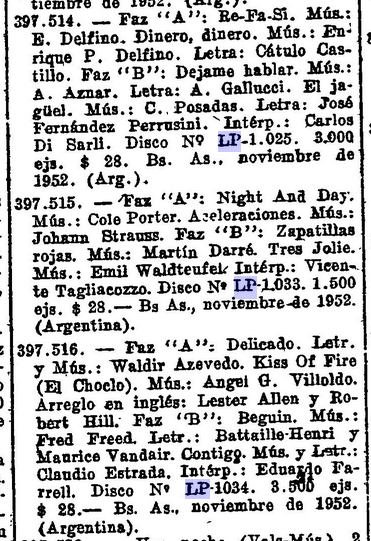 Though I couldn’t find any publication of the release dates for the last 3 vinyls but this is maybe related to some missing Boletíns of the year 1954 in the archives. 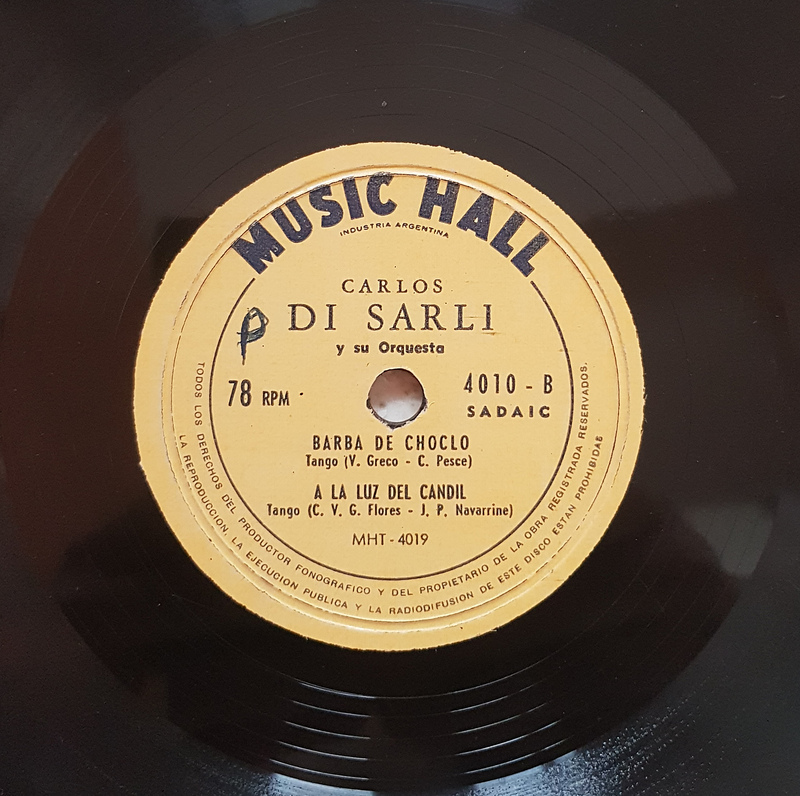 As an overall evaluation I would like to mention that these 84 Di Sarli Music-Hall recordings were all very well done, they sound great, especially the original 7″ vinyls. 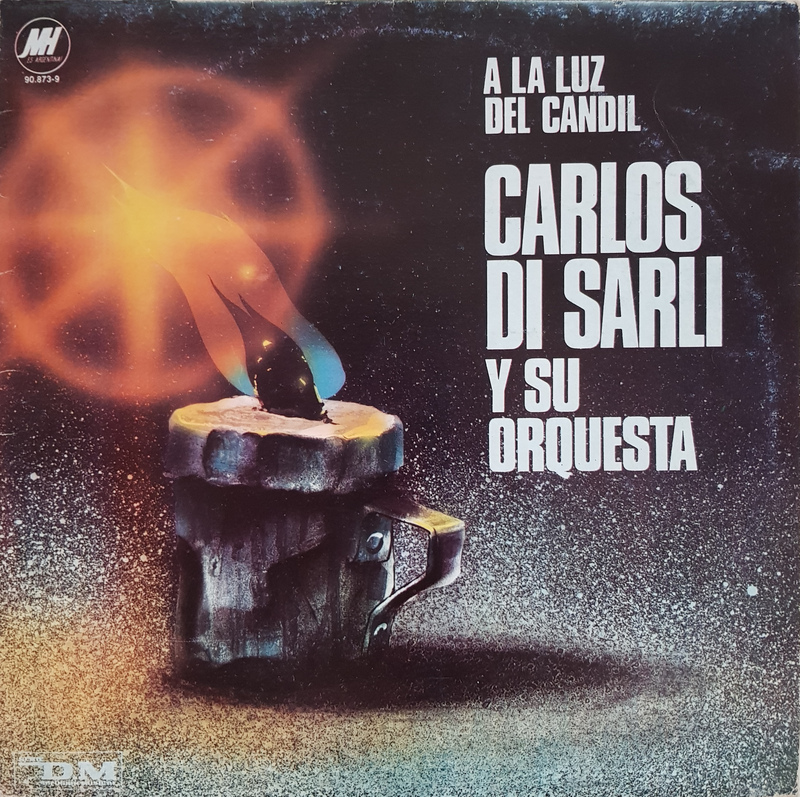 When you listen to a well-preserved copy, you get indeed the impression that the maestro himself is descending from the heavens, MH themselves called their sound fidelity equal to reality, fidelidad que iguala a la realidad. 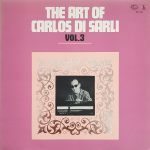 This high sound quality is though not always maintained on later vinyl re-editions, especially the 12″ vinyls often have less good sound. 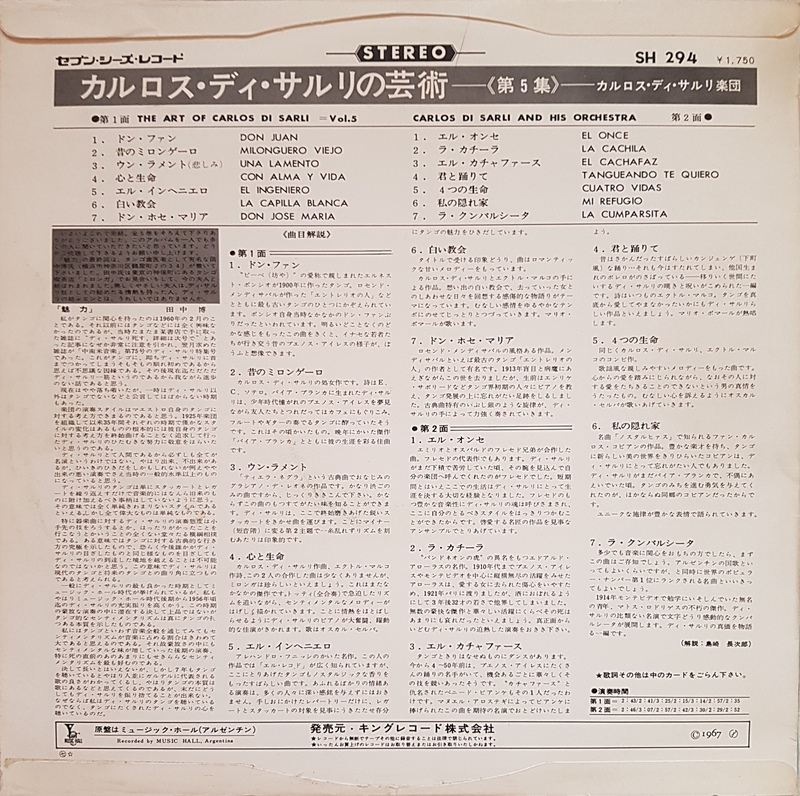 They partly messed up the original equalisation and added on the latest generation LPs some reverberation. 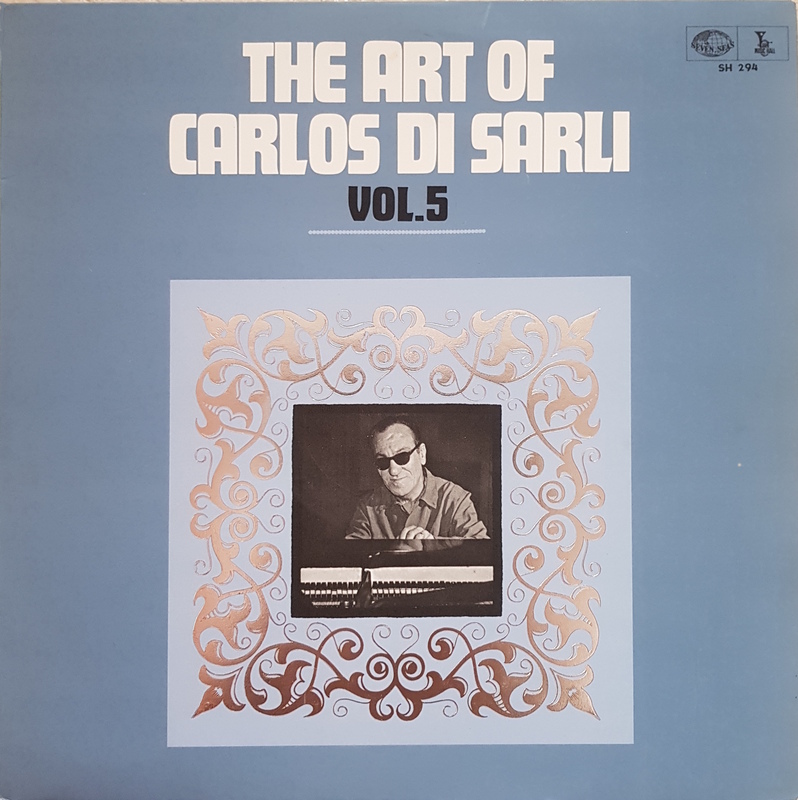 There are also some strange problems with the gain where the sound engineer started the transfer too loud and corrected the gain only later after the first bars. 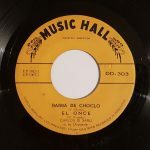 On the earlier 10″ and 12″ vinyls there is very muffled sound on some tracks which are therefore virtually useless. 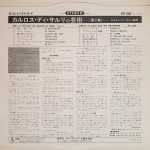 A few tracks on these next generation vinyl transfers are OK. Also positive to mention, I didn’t recognise any pitch/speed problems on the following generation vinyl transfers like one sadly often hears with other record labels. 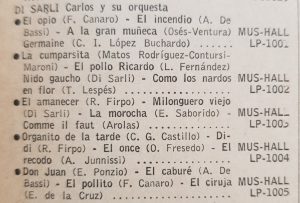 In 1985 Music-Hall issued a compact cassette and on the inlay they marked some titles with the mention “° Temas nunca publicados en LPs con anterioridad”, titles never published on a later LP transfer. 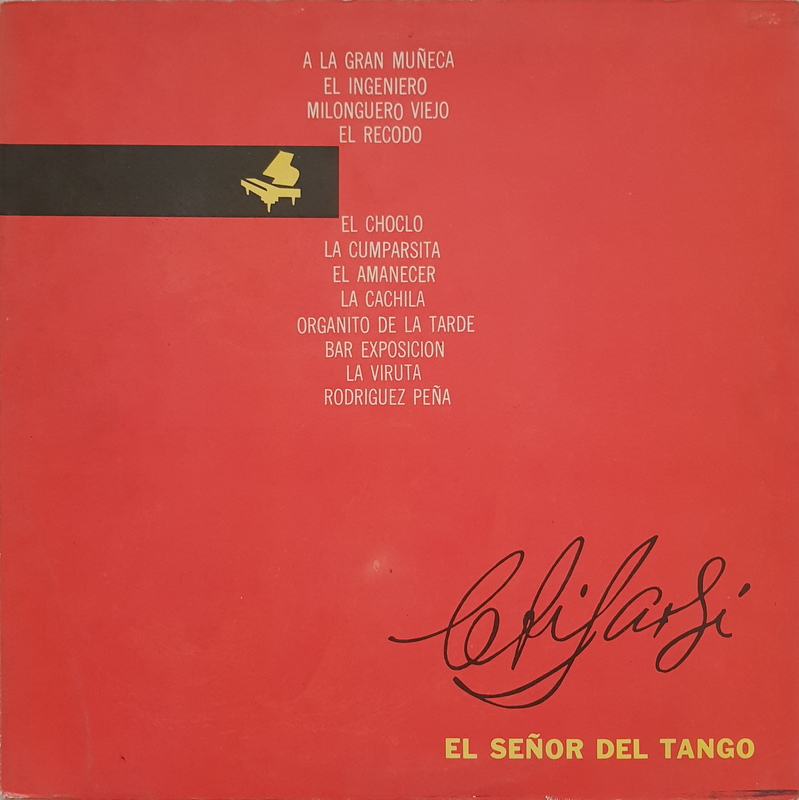 Some of these titles are among the hard to find: La misma tarde, Fulgor, Chimentos and Se muere de amor. 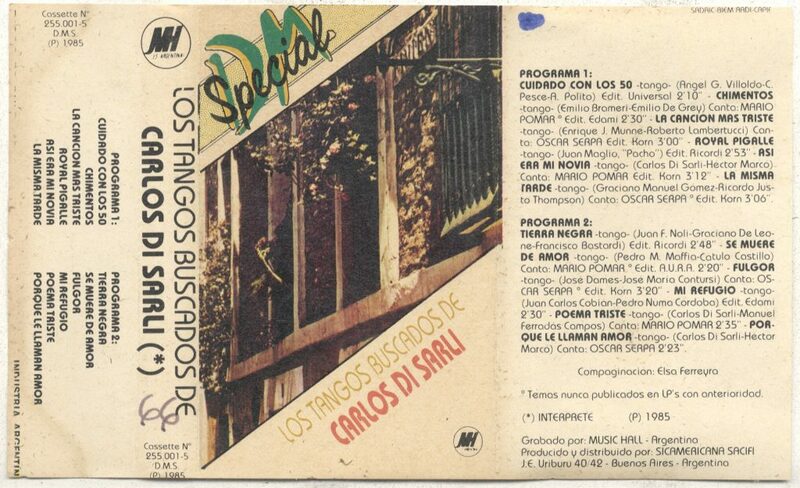 Whereas Cuidado con los 50, La cancion más triste and Royal Pigalle strangely aren’t marked as such to my big surprise! 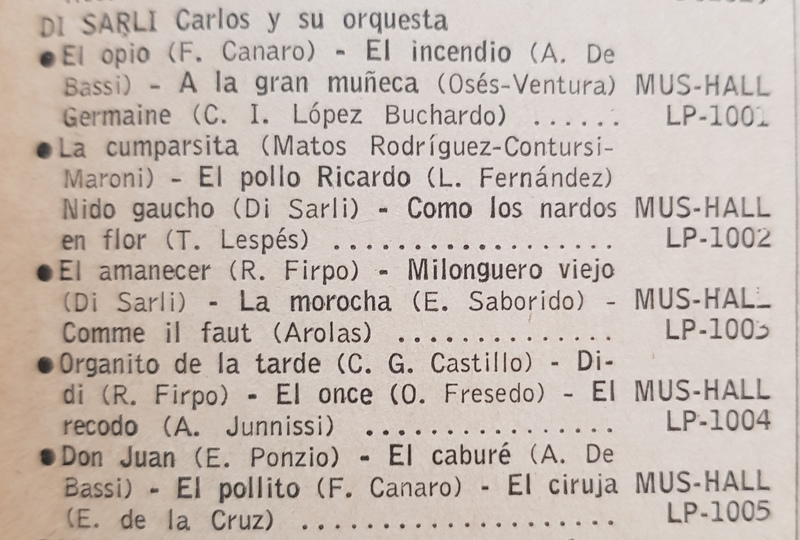 Chimentos and Se muere de amor were actually published on their 8000 series LP (10″), maybe they forgot this or made a marking error, which narrows down the effectively never republished titles to these 5 recordings: La misma tarde, Fulgor, Cuidado con las 50, La canción más triste and Royal Pigalle! 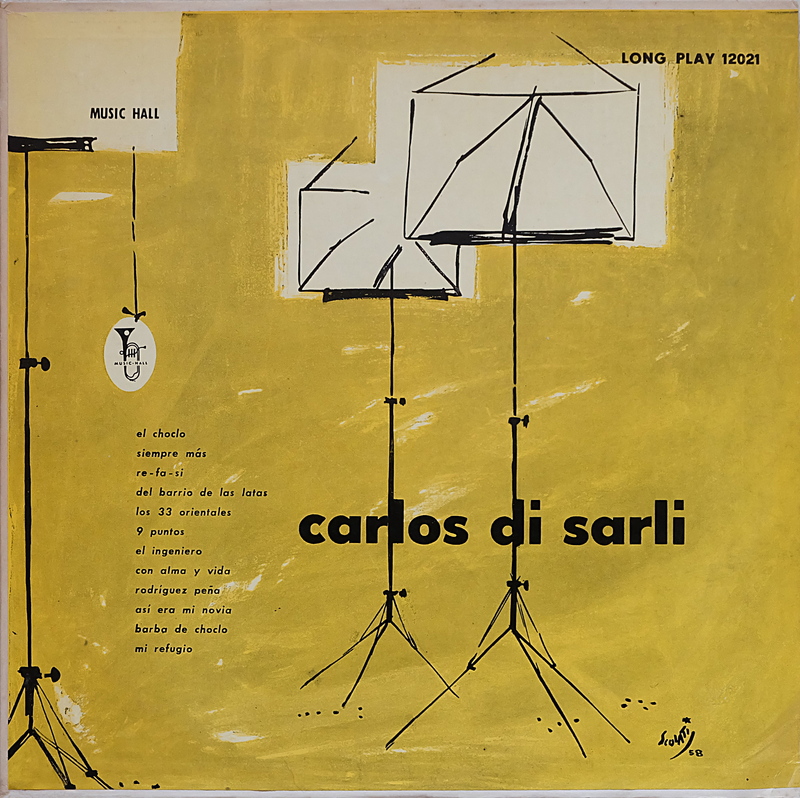 The downscaling o f the initially ambitious project and the too early adoption of vinyl for the domestic market with all the resulting problems might have contributed why Carlos Di Sarli returned by the beginning of 1954 to RCA Victor. 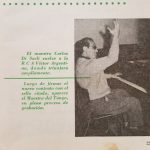 It could also be related to the change of the recording studio, the last 24 recordings were produced at the studios of Radio Splendid. But maybe it was just the end of their contract. There is a lot to speculate which is favored by the circumstance that the initial distribution of Music-Hall seems rather experimental based on a trail and error method. Discomania shows him in their August 1954 edition as to be back at the RCA Victor studios without mentioning any further motives for the change. 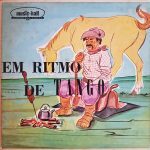 Concerning the concept of guest artists, finally, the 7″ vinyl series has numbering discontinuities when we check the discography. 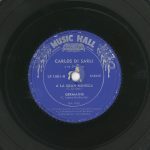 During the first 10 records the numbers were all used for Carlos Di Sarli and then there are holes. 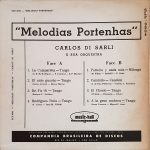 These missing record numbers were actually used for other artists and genres, like Cole Porter (LP-1033), Herbert ‘Happy’ Lawson (LP-1044) and a lot more. 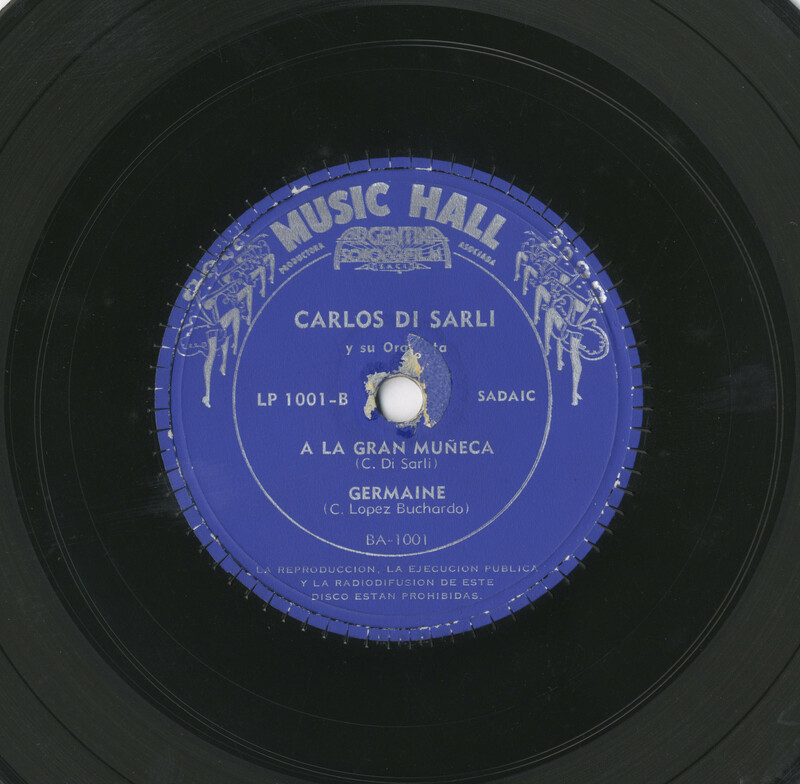 The Giácomo Rondinella and Luis Sagi-Vela recordings were running on a separate record number prefix in order to distinguish the classical music aspect, the LP-5000 series. 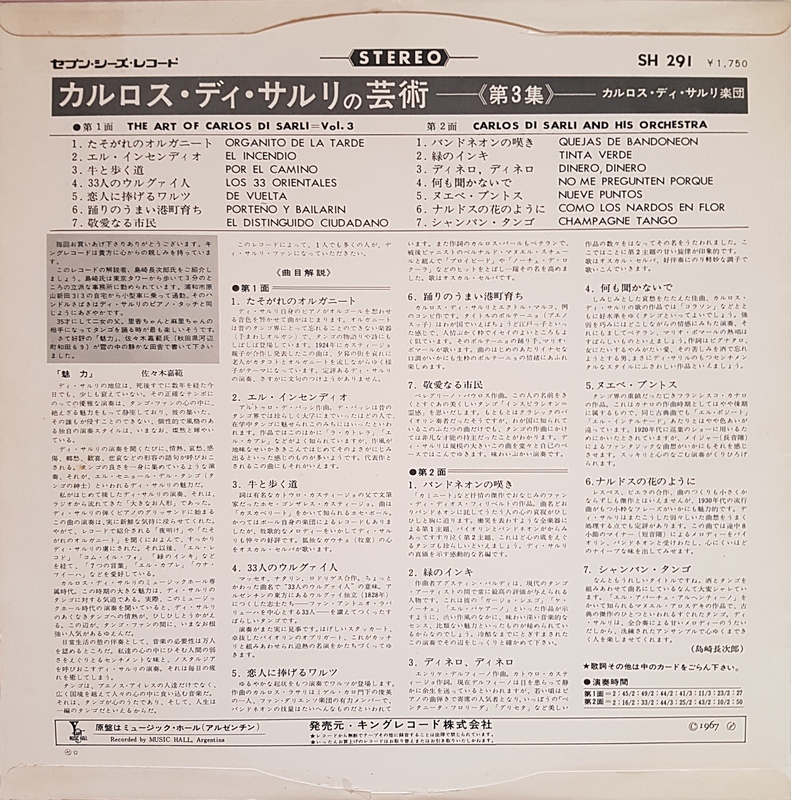 The LP-1000-series was initially the popular music classification. 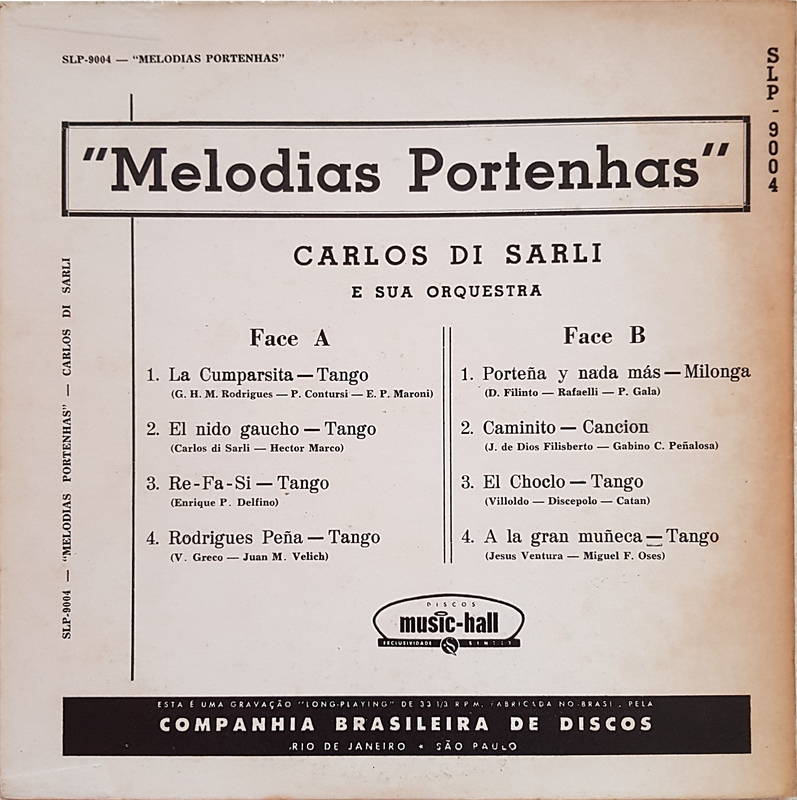 All these recordings were never published together on a shared record like the initial idea proposed but were juxtaposed on separate records. It’s much later that Carlos Di Sarli recorded an LP album alongside with another artist. 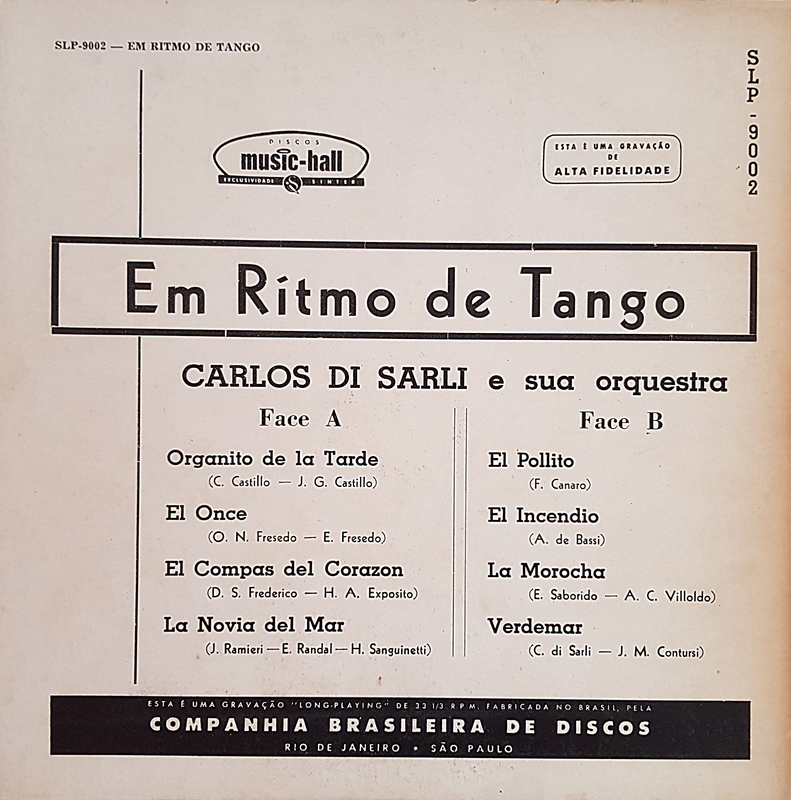 By then he had long left MH and after some years at RCA Victor he joined the Philips label during his last recording sessions with the orchestra. 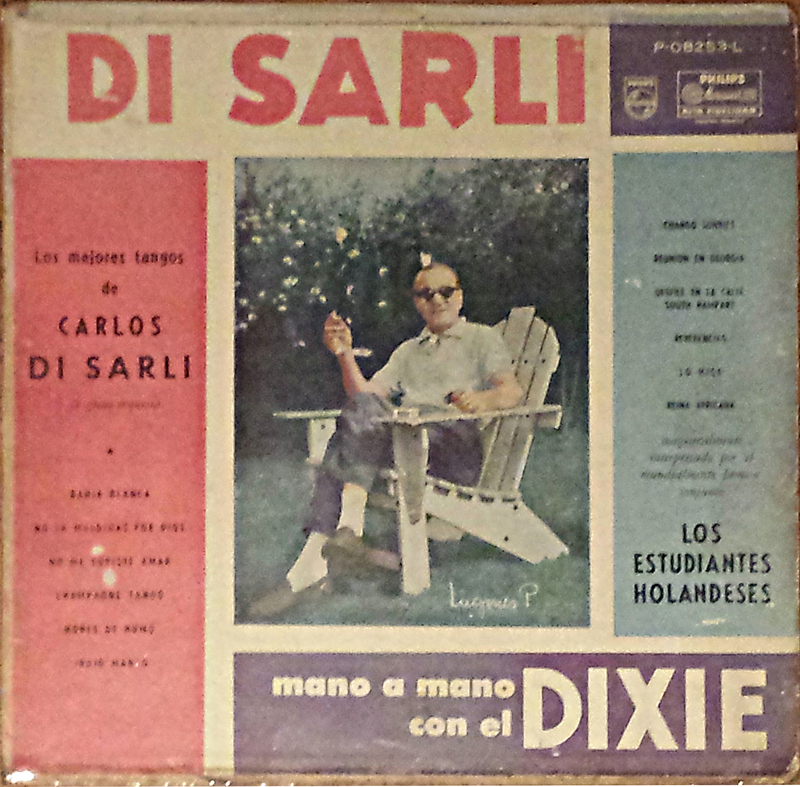 This shared record was published in 1960 and it’s called Carlos Di Sarli mano a mano con el Dixie. 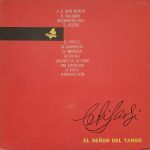 Los Estudiantes Holandeses are also known as the Dutch College Swing Band. 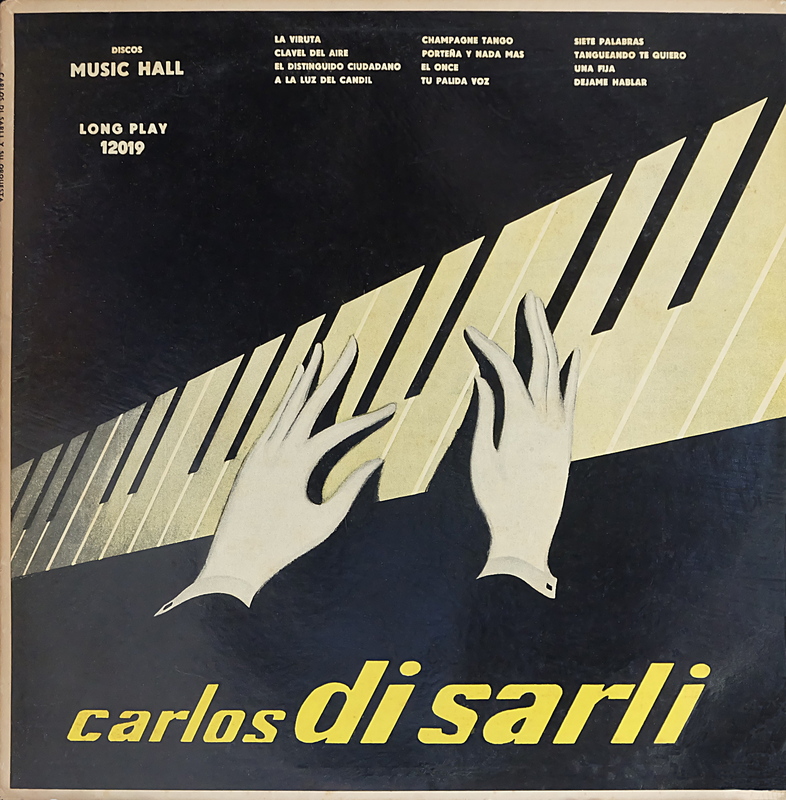 The record contains a succession of one track by Di Sarli and one swing orchestra track, in ping-pong battle mode, all recorded in a (fake sounding) live environment. 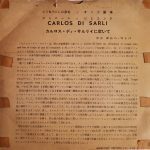 In the end his idea of an intercultural concept became a reality! 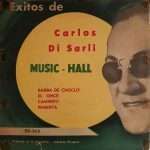 As we can see now from our future perspective the high goals of the initial Music-Hall project were flattened and a compromise was found. The recordings were nearly exclusively distributed in Argentina and Uruguay and the guest artist concept abandoned. 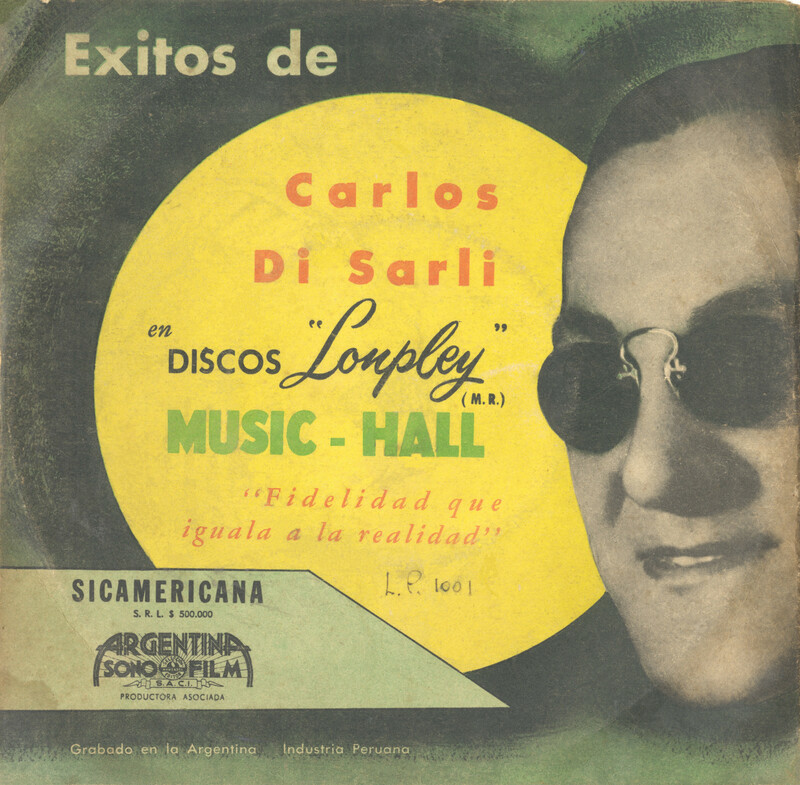 Instead of exporting Argentine titles to the rest of the world, mostly foreign artists were imported into the domestic record market via Music-Hall. 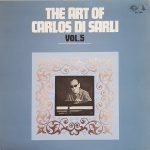 The maestro delivered fantastic recordings but they didn’t find any major international resonance back in the days. 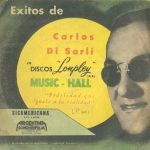 How would he be delighted to see that nowadays his music is played globally! 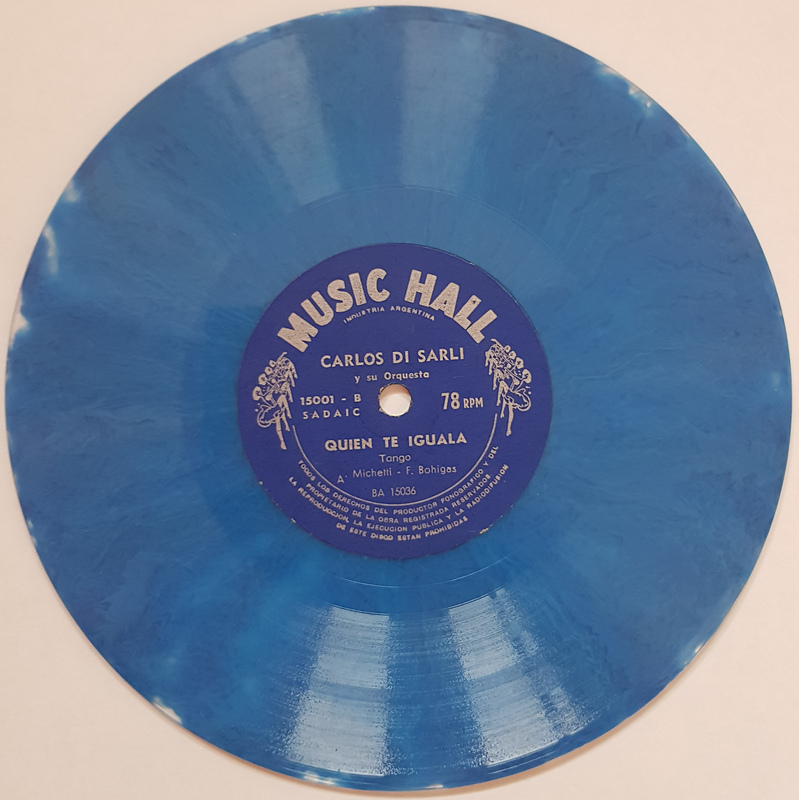 And last but not least, see here for a visual succession of the main Music Hall vinyl generations, from the first issue starting in 1952 to the last LP edition from the 1980s. 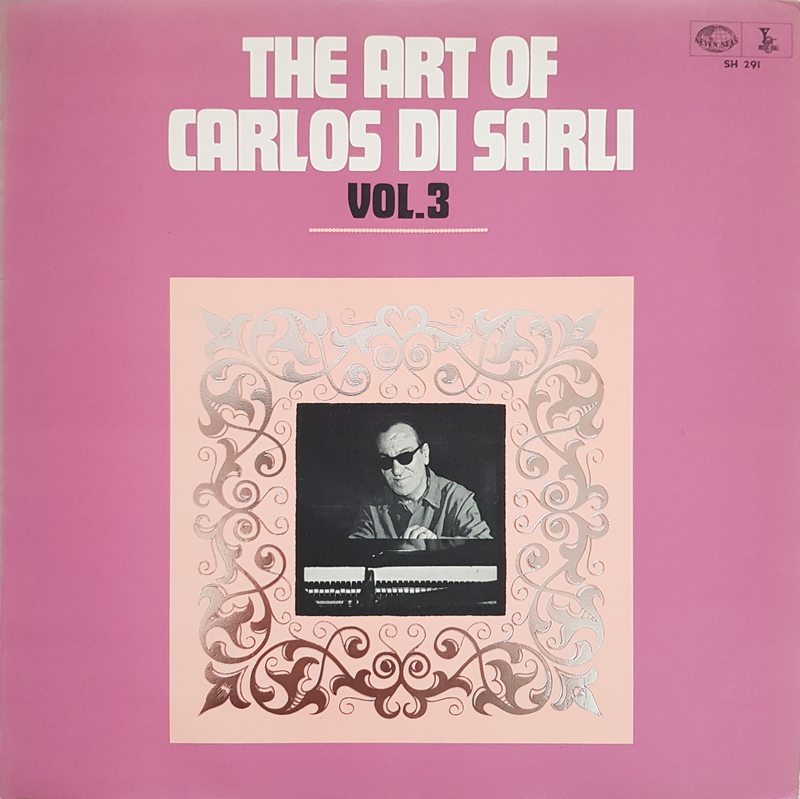 The reverberation was added on some tracks since the 1979 edition. 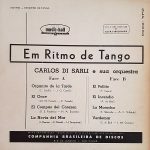 And the edition El señor del tango, red and green/blue monochrome cover, is a reduced two volumes edition, focusing on the most known initial titles. If you want to contribute to this document, if you have suggestions or information to share, please mail me. 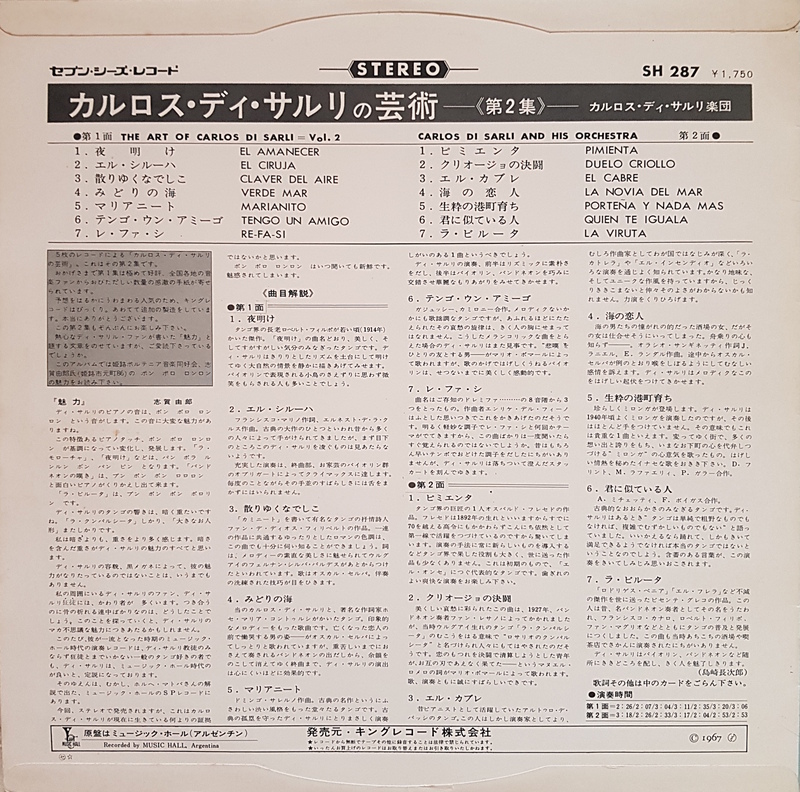 Addendum: Recently, while visiting a friend, he showed me a record from Japan which was issued very close to the original Argentine release date. 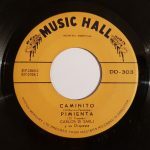 It’s the same 7″ vinyl format as in Argentina. 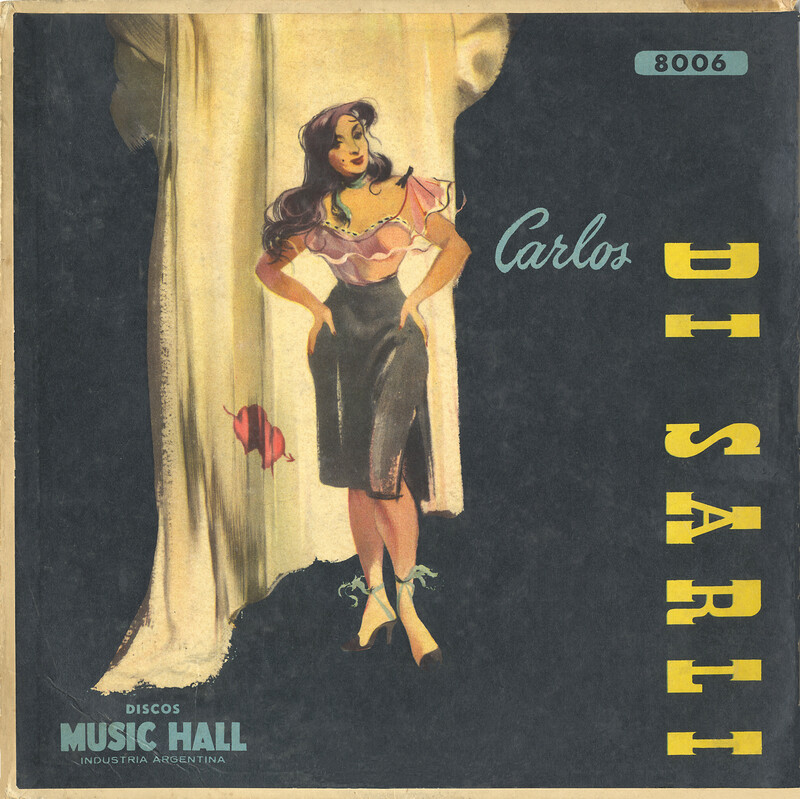 It is very likely that CTA’s reissue of the Carlos Di Sarli Music-Hall recordings is based on that series. 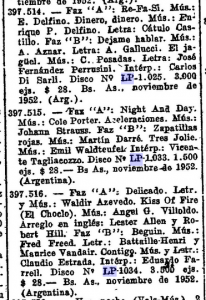 This shows that MH had a much earlier international exchange than I was initially thinking. That could also explain certain questions which were raised concerning the last 3 records which have never been seen and might therefore likely to have ever been published. 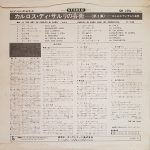 Maybe the whole series has been published in Japan on Mercury Records Japan in their DD-300 reprint! Interestingly they are in 45-rpm (the Argentine series is in 33.33-rpm speed) which means they were most likely transferred anew from MH reel-to-reel tape copies sent to Japan. in 1 day and 17:22 hours. in 6 days and 18:22 hours. in 14 days and 20:22 hours.